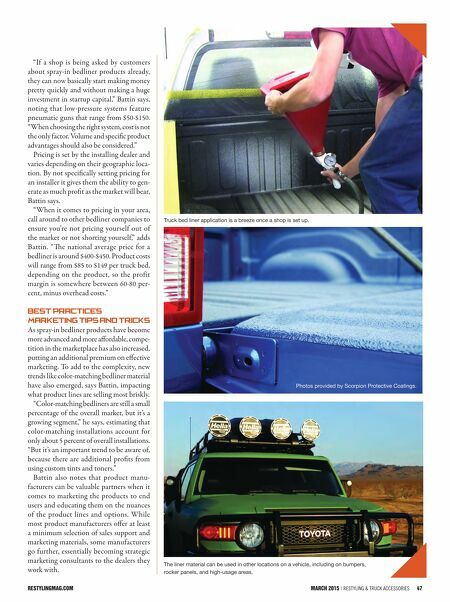 46 Restyling & tRuck AccessoRies | March 2015 restylingMag.coM 46 Restyling & tRuck AccessoRies | March 2015 restylingMag.coM Bedliner Marketing Takes A Team In the fast-growing spray-in bedliner market, suppliers like Scorpion Protective Coatings can also be effective marketing partners. F or a restyler or truck accessory retailer already doing a brisk busi- ness in aermarket truck accesso- ries, the idea of entering the growing spray- in bedliner market can be a tempting but daunting proposition. e lure of steady additional sales to existing customers and a considerable new profit center also brings with it the challenge of mastering and mar- keting a new product segment. With recent advancements in product quality and color stability derived from improved chemistry—and with cheap oil incenting steady growth in the sales of new and used trucks—conditions are attractive for new dealers contemplating entrance into the bedliner market, says account manager Beau Battin of Cloverdale, Ind.-based Scor- pion Protective Coatings. 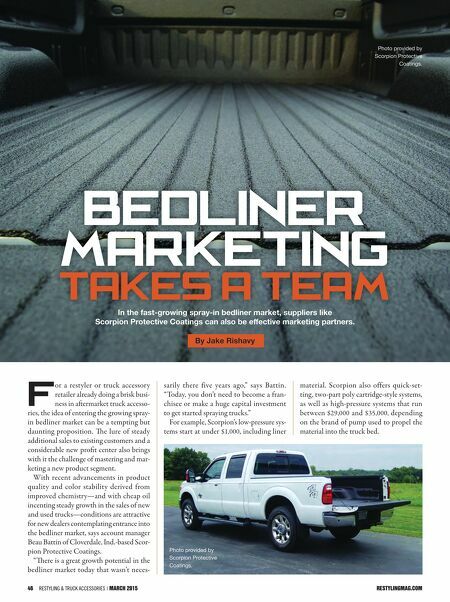 "ere is a great growth potential in the bedliner market today that wasn't neces- sarily there five years ago," says Battin. "Today, you don't need to become a fran- chisee or make a huge capital investment to get started spraying trucks." For example, Scorpion's low-pressure sys- tems start at under $1,000, including liner material. Scorpion also offers quick-set- ting, two-part poly cartridge-style systems, as well as high-pressure systems that run between $29,000 and $35,000, depending on the brand of pump used to propel the material into the truck bed. By Jake Rishavy Photo provided by Scorpion Protective Coatings. Photo provided by Scorpion Protective Coatings.